Art provides another medium through which human beings experience gifts of the spirit. Response to a work of art may be on intense, profound levels. As with poetry or literature, theatre, dance or music, the visual arts provide meditative and emotional opportunities and appreciation of life's process, our cultures and society. Unity Church has gallery space for the showing of works of visual art. It is anticipated that these exhibitions provide spiritual enrichment and liveliness for those attending the church and its functions. At the same time the gallery provides an opportunity for artists to show, share and sell their work. ​Submit your work for consideration! The Unity Church Art Team accepts applications each year during the months prior to May 1st of each year. The Art Team considers these applications in May and selects artists for monthly shows that will start in the following fall months. ​If you would like to submit work for consideration, please read: Policies Parish Hall Artists 2019. Click the image to read our 2019 Call for Art. Joan G. Cox, the April Parish Hall artist, was born in Connecticut and grew up in Chicago, but has called the Twin Cities home since her graduation from the University of Minnesota, where she majored in French and Art History. She later took studio arts courses at the University and at Hamline University over a period of five years. She has maintained a studio in the Dow Building in Saint Paul for three decades. At first, figures and landscapes accounted for much of her work, fed by sabbaticals in England, France, and Italy. Several commissions to design stained glass windows led her into abstraction and non-representational work. She likes to experiment with a variety of materials. Joan has shown at galleries in Minnesota, Wisconsin, Florida, Santa Fe, and Denver, as well as at The Plains Museum in Fargo, the Duluth Art Museum, the DeVos Museum in Michigan, and abroad in France, Ireland, and Italy. In 2016, she received the First Place Prize for Painting at the Minnesota State Fair. Rarely do I start a piece with a visual goal. Painting, for me, is an intuitive process involving emotion, imagination, judgment, and serendipitous chance, each playing a role on a journey of discovery. The pieces in the Parish Hall represent several series done over the last several years. Informed by the natural world, they are fed by the experience of working out-of-doors for nearly half the year: summers in a tent near a lake in the north woods of Minnesota, winters under a shelter on a barrier island in southwest Florida. Caldie is a perpetual apprentice to the arts and to the beauty of life. Born is St. Paul,Minnesota, he began drawing and painting in his teens and enjoyed an early career as a self-taught musician. His captivation with nature prompted frequent canoe expeditions into the Canadian wilderness and his creative curiosity led him to design, own, and operate several upscale restaurants in the Midwest before engaging in a rewarding career as an architectural designer. In 1999, Caldie was involved in a serious traffic accident that prompted him to re-evaluate his life’s purpose. After undergoing eight surgeries to restore a substantial loss of his vision, he sold his design practice, moved to Arizona, and dedicated himself to the mastery of his life-long passion for the fine arts. Family and friends enticed this artist to return to Minnesota after nearly 20 years of residency in the Southwest, where his painting talents began to flourish. It was patience, keen focus and sheer determination that eventually distinguished this mostly self-taught artist as a master, and his art can now be found in collections all over the world. Traditional painting disciplines are sometimes combined with three-dimensional elements to express a more tantalizing and creative concept, always with a vigorous commitment toward composition. Adjusting to the change in climate, this artist offers several of his artistic expressions, during the month of March, as a way to introduce himself to the Unity Church community he now gratefully calls his own. It seems that the preferred human experience is that of beauty and order. In my paintings, I attempt to employ these elements to lure the spectator away from the turbulence of their daily circumstance and offer them relief in a subtle narrative that can only be experienced in the hush of their emotional response. Steveboyyi Makubuya lives in Uganda. He doesn't know when he was born. Brought to a children's home at the age of around nine months, he grew up without the knowledge of his name, his parents, birthday, or even the presence of a family. When the orphanage closed its doors, Steven was 17, and he continued his life back on the streets, relying on his creativity and courage to survive daily obstacles. His artistic themes reflect a longing for family integrity, the constant struggle for survival, and evoke the raw essence of street life common throughout Africa. The spare spatial composition of his work allows the viewer to imagine the social milieu surrounding the central characters and provides an opportunity to thoughtfully walk along with them as they go about the common tasks of daily living. Steven is a child of Africa who has a strong desire to reach out to the world through his art, to help relieve suffering wherever possible, to remind us of the day-to-day struggle faced by countless people around the world, and also to provide us with the opportunity to see the possibility of finding hope, joy, peace, and true happiness despite our circumstances. Steveboyyi was given the opportunity to visit the U.S. in 2017 and participate in his first ever solo exhibition. His stay was cut short due to unforeseen circumstances, and upon returning to Uganda, Steveboyyi lost the use of his eye. The work in this exhibit was created following his eye accident and passed through many hands to get to the U.S., given the lack of a formal mail system in Uganda. His exhibit is being handled by friend Moira Villiard from Duluth, MN. Titles include: “Out of Place,” “Is There Other Bad News?,” “Touch of Peace,” “Olive Tree Warning Ribbon,” “Space for Hope.” These framed works offer us a window into Palestine by artists living and working there. The works are for sale and the money goes to the artists. The art was brought to the United States by Bright Stars of Bethlehem, a 501c3 organization whose aim is educating the next generation of creative leaders in Palestine. This work supports three main initiatives: Dar al-Kalima University of Arts and Culture, Diyar Academy for Youth, and Ajyal Senior Care Program. Rev. 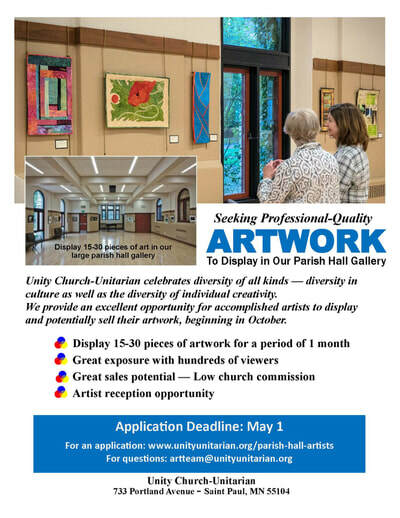 Dr. Mitri Raheb, President of Bright Stars of Bethlehem says, “In the midst of conflict, art creates room to breathe.” Unity Church member Jo Lucas offered this opportunity for the art to be on exhibit in the Parish Hall. Kurt Seaberg loves the way the texture of the stone preserves the liveliness and spontaneity of the drawing, as well as the numerous possibilities the medium of lithography offers to further transform and manipulate the drawn image. Kurt writes, "Being a printed form, it makes my art and what I am trying to communicate more available to others. One of the tasks of the artist is to remind us where our strength and power lies in beauty, community, and a sense of place. Nature has always been a theme and source of inspiration in my work, in particular the spiritual qualities that I find there. My hope is that my art will evoke the same feelings that arise in me when I contemplate the mystery of being alive in a living world: humility, gratitude, and a sense of wonder before what I believe is truly sacred." My tapestries tell stories about my life that are universal to human kind. They tell of life challenges that are overcome. They illustrate loss and unexpected gifts. They talk about creation and re-creation that comes from grace. Designing and weaving tapestries became my way of navigating my journey with my husband's Parkinson's. My art became my refuge while I was his caregiver and was my voice through the dark and joyous journey. Everyone has a story. Your story may be about a life transition. Your story may be about a special event that shaped your life. Your story may be a metaphor that shares something unique about yourself. What are the images of your stories? What would you share with others? The October Parish Hall art exhibit highlights the artwork of the children of Unity Church. There will be a combination of work done by the children and some documentation of the children’s work. The theme of wonder is meant to be an invitation to wonder together about our children, who they are, who they yearn to become, and their spiritual lives and identities. There will be an artists reception on Wednesday, October 10, at 7:15 p.m., to celebrate our children's art. We look forward to entering into wonder together and examining how a relationship guided by wonder transforms us. Rachel Cain is a local photographer who has been taking pictures for over 20 years. She photographs many subjects, but is particularly drawn to rural landscapes and barns. Rachel sees what is there and imagines possibilities. Hence, she may go back to a site several times to capture the image in different light and weather conditions. She uses editing software to bring out the essential qualities in the image as she sees them, whether that be various details and/or a certain mood. The elimination of distractions allows the viewer to readily access her or his own history and emotions in reaction to the subject. Rachel says "my best images are the ones where I have the strongest emotional reaction to the subject; these tend to be the ones that resonate the most with viewers." Rachel has exhibited in numerous venues including the St. Paul Art Crawl, the St. Anthony Park Art Festival, the AZ Gallery in St. Paul, the Hopkins Center for the Arts, the Phipps Healing Arts Program, Gallery 96 in Shoreview, the Minneapolis Photo Center, the White Bear Center for the Arts, and the Morpho Gallery in Chicago, IL. She has won awards at several of these galleries. Some of Rachel's images were published in the annual Capture Minnesota books from 2012-2016. Rachel's work including barn, landscape, floral, bird, still life and travel images can be viewed at: http://cainrachelr.wixsite.com/rachelsphotos. Photography has been a consistent and forceful interest in Edie Karras's life for over 30 years. She started out in black and white, then delved into color; all the while exploring different themes in nature, portraiture, photojournalism, and still life. For the last five or six years Edie has used her iPhone 95% of the time, and generally edits in Instagram. The images in this show were produced in this manner and are part of a body of work entitled “Nature in a Dream State” that debuted in May at Vine Arts Center. This exhibit took root in a somber event — the death of Edie's mother-in-law’s — but blossomed into a colorful, vibrant body of work. In April 2017 Edie and her family drove from Minneapolis to St. Louis for the funeral. They left snow, ice, and cold behind and journeyed into warmer temps and a slowly greening landscape. By the time they arrived in St. Louis it was truly spring. Before entering the city, the family stopped at a state park to stretch their legs. Walking around in sweatshirts, they soaked in the open water, gentle breeze, sun, grass, and birdsong. Edie took the first photo of this exhibit in that place — “My Missouri Spring Fever” (it has since been purchased). Throughout the rest of the year Edie endeavored to extract a soft, haze, gentle persona from flowers and landscapes. She tried to capture these characteristics through manipulation of color, contrast, resolution, and a number of standard photographic elements of image making. The August Parish Hall exhibit represents the feel and visual form of what each artist perceives of resiliency. The intention of this work is to cultivate conversation, hope, and an understanding of its importance in life. As a collective of 16 artists, the Avivo ArtWorks Collective embraces diversity, works to build community, and present their art publicly. “In doing so, we are challenging mental health stigma, and demonstrating that people living with mental illness can achieve success in art and life. We also aim towards building personal leadership, encouraging individuality, and supporting one another in our lives and in recovery.” For more info on the collective, please visit https://avivomn.org/services/mental-health-services/artworks/collective/. Rose Allen has always had a passion for fiber. Quilting is her medium. She enjoys creating both functional and art quilts. Sewing and handwork are part of her daily meditative practice. She designs intuitively — playing with color, texture and shapes on her design wall. She loves to collaborate with other artists — especially her husband Gary Jurek. Rose is a member of Unity's Evergreen Quilters. Gary Jurek views stained glass as an art medium that accents the whimsical. The combination of sun, color, design, and vibrant glass impacts our living space and captures our imagination. Gary adds, "it also goes well with quilts!" As a native Minnesotan, water has been a primary contributor to my lifestyle and source of endless inspiration for me since early childhood. I grew up spending my summer days and evenings in a swimming pool. I was a lifeguard and swimming instructor in my late teens and throughout college while my family had a lake cabin until 2011. As an adult, I have lived on or near a river for most of that life and I spend as much time on the North Shore of Lake Superior as possible. I wanted this exhibit to pay homage to my birthplace and to the fact that my late father worked for Hamms brewery in St. Paul for over thirty years. Many will recall the popular beer adds that boasted our fair state. I owe a great deal to this heritage of water! I think of water as a continuous source of universal energy that links us all and am especially grateful to live in a part of the world where I can enjoy it in abundance. I approach each body with respect and reverence. In much of my work, and especially in the pieces selected for this exhibit, I use intentional camera movement and slow shutter speeds to try and connect with that energy. Working in this manner is very much a spiritual practice for me. This exhibit is also a first attempt to pair my photographic art with my poetic musings. Journaling to explore periods of transition in my life has been a less developed spiritual practice but, nonetheless, very powerful. I find these musings often take poetic form and, in preparing for this exhibit, realized that I have written a lot about water and my relationship to it. An artist's reception will be held on Monday, June 25, from 5:00-8:00 p.m., in the Parish Hall at Unity Church. All are welcome. Jill Michell is a painter and teacher. Having previously worked as a studio artist, Michell began to work outdoors in 2014. Immersing herself in the landscape unleashed a new passion for realism that is interpretive, rather than literal or photographic. Her new landscape paintings reflects a deep pleasure in the act of painting. In winter, when painting out of doors was impractical, she returned to the studio and began digging deeper into the possibilities of this approach to realism. Her studies of geraniums narrowed her focus to natural minutiae. Jill offers a tribute to her favorite Chinese painter, Qi Baishi. Qi theorized that, “paintings must be something between likeness and unlikeness.” Using heavy ink, bright colors, and vigorous strokes, he created works of a fresh and lively manner that expressed his love of nature and life. Although her technique is quite different, Michell paints with the same spirit in mind. A reception to open the exhibit will be held in the Parish Hall from 6:30-8:30 p.m., on Friday, May 4. Enjoy Evergreen Quilters’ exhibit “Once in a Blue Moon” in the Parish Hall April 1-29. All the small quilts and quilted wall-hangings on display are part of their biennial silent auction and are up for bid. You may also purchase $2 raffle tickets for “Blue Moon,” a stunning 88” x 100” quilt made by a group of about 20 Evergreen Quilters. Register for a bidding number and learn how to use the bidding system at the Evergreen Quilters’ table in the Parish Hall on Sunday mornings in April. Then place your bids for your favorite quilts and wall-hangings. To bid, you can use your smart phone anywhere throughout the month, or the tablets available in the Parish Hall after services on Sunday mornings. Bidding ends at 12:30 p.m. on the last day of the exhibit. Items may be paid for and picked up at that time or by arrangement the following week. The winning raffle ticket will be drawn at 12:30 p.m. on Sunday, April 29. You’re invited to help celebrate Evergreen Quilters’ show at their opening reception in the Parish Hall on Friday, April 6, from 5:30 to 7:30 p.m. That evening you can see the quilts, meet the artists, enjoy refreshments, and place your bids. Bring a friend or two! Sundays, April 8, 15, 22, and 29, you will also be able to purchase additional Evergreen quilters’ smaller sewn and quilted creations at their "Buy-It-Now" table. Small quilted runners, zipper bags, potholders, and other items are designed for you to purchase and make great gifts. Think Mother’s Day, spring birthdays, graduation gifts! Evergreen Quilters create quilted items of all kinds to raise money that helps support three organizations dedicated to serving hungry and homeless people in our community: The Family Place, a day shelter for homeless families; Hallie Q. Brown Center, a local food shelf; and Jeremiah House, a program and housing facility for young mothers and their children. We also often donate to Obama Elementary School campaigns to raise money for neighborhood families’ after-school and holiday meals. To all these agencies, we donate one hundred percent of the money we raise. If you’d like to quilt for social justice causes, please join Evergreen Quilters. Participate as much as you can, whenever you can with no guilt. Collaborate on quilting projects and share quilting knowledge, creativity, and skills with other like-minded people. Those of all skill levels are welcome; instruction is offered to beginners. The group meets at the church on the second Tuesday evening each month, and at various locations on the fourth Saturday each month. Please join us! Phone Peggy Wright at 651-698-2760 to check on the next meeting location before attending. Peggy can also answer your general questions about the group and its programs. Over the years my photography has gone through a transformation, from traditional to more painterly photo impressionism. I continuously strive to make my images uniquely different. A good friend of mine said that I’m a, "photographer with a painter’s soul” a phrase that describes me very well. I have been a photographer for over 30 years and I have seen big changes in the last fifteen years. Photography has moved from traditional film to the digital age. Computers and imaging software have expanded photographers’ horizons and many of us are riding the crest of this new frontier. It feels good to me to be part of this exciting experience. Where this journey will lead, I haven’t got a clue, but I am enjoying the ride! The process of creating my work is not magic, though observers do wonder at times. It can, however, be a struggle at times to create my vision. The camera is a vessel that captures my idea. When that image is slipped into Photoshop it allows me to transpose it into an image that many times amazes even me! Photoshop is to me what the painter’s palette is to a painter. My photographs flirt with an assortment of artistic styles. I have been told by others, that many of my images reflect the painters of the past. What it boils down to is, I don’t make the art the art makes me. My dedication as a painter, as someone who needs to translate the real world into a visual poem, is a life-long journey. My goal is to express my own emotional response; to capture the essence and mood of the natural world through the language of painting. To me, painting is not a literal translation of nature but a personal impression conveyed through the foundations of composition, value relationships, color harmony, edges, and brushwork. These elements are what give a painting credibility. Plein air (open air or outside) painting is the perfect blend of painting and the outdoors. It’s nature’s classroom where the concept of light and its effect on the visual world can be studied and observed. Because of the ever-changing light conditions, I am forced to concentrate on the essentials of the scene without any unnecessary details. I have always had a deep appreciation for nature. It is a privilege to express that connection with artist’s tools. I am inspired by the late afternoon sunlight on the treetops along the water’s edge or the rugged snow covered mountains of the west. If I can convey this emotional response to the beauty in nature to the viewer and elevate their value of the natural world around us with a sense of truth, awe, and respect, I have done my job. Because of the current state of politics in our country and man’s relentless monetary greed and lack of foresight regarding our environment, it’s imperative to our collective future to protect and preserve our gift. In March and April, the Unity Art Team is featuring two talented youth artists from Unity Church — both photographers who’s works are showing in the west hallway of the Eliot Wing, main floor. Please take a look at their exhibit. I go to Central High School in Saint Paul where I take classes in math and black and white film photography as well as a variety of other subjects. Being a photographer has helped me explore the human body, mind, and soul. The theme of this series of photographs is self-discovery through others. The medium of film was used in the series mainly because of the camera I have and the experience provided by the classes available at Central; however, this was never a constraint: black and white printing seems to work well with the theme. A photo captures the reality of a moment and the beauty of a split second; color, contrast, emotion, and light come together to form a perfect picture. Or a not so perfect one. The job, or the gift, of a photographer is to find the balance and preserve it. I see beauty in a glass of ice water, a rear view mirror, a Christmas ornament. To photograph the unexpected beauty of our often-ugly world is my motivation. I started photographing little things: flowers, pets, fragments of my life. Then I expanded, adding texture and focus and branching out from my Saint Paul home to places like New York and London. I try to capture perfect moments everywhere I go. I have selected just a few of my many photographs for this exhibit. Each captures a unique emotion in a unique place: the warmth of summer, the joy of our pets, the nostalgia and comfort of Minneapolis and Saint Paul. But each photo separately couldn’t amount to the impact of them all together. I invite you to take a step back and see the exhibit as one unified work of art, connected by our inherent recognition of the beauty in our lives. Tom McGregor’s earliest memories are of the time spent drawing on a large slate chalkboard in the back room of his mother’s business, completely absorbed in his work. That feeling of total immersion is something he strives for every time he paints. Since graduating from Minnesota State University Moorhead in 1987 with a BFA in art, Tom has pursued a career as a self-employed graphic designer with an office in Saint Paul, Minnesota. When he discovered plein air painting in 2007, painting became his primary creative outlet again. It combines his passion for being outdoors with his love for painting. Tom strives for honesty in his work, trying to be true to what he feels passionate about while immersed in nature. He tries to find, not just the beauty, but that which tells a story, has a history, affects him emotionally; but most of all, challenges him to think about where he is as a human being living in this particular time and place. In this series of work I start with digital photography and then draw, paint, and collage on printed photographs in order to reflect on, or reveal images that are deep-rooted in my mind and memory. The content of the work reflects my personal history, both as a human and as an artist. I work in layers using color and mark making as primary tools. A foundation or background layer is created using camera movement to capture images of objects in motion. Layered on top of this foundation are other images, often related to my personal history. The work is symbolic and metaphorical. For example, the image of a "house," or more simply a triangle on top of a square, is a frequently used element in my work. This house symbol refers to a place of shelter, protection, and ritual. The December exhibit in the Parish Hall is by Unity Church member Richard Birger. This is a different direction for Richard, who in the past has exhibited images from the American West. These images are from a variety of recent political and social actions and events here in Minnesota. They illustrate how our society is becoming less and less cohesive and more and more tribal. Our politics reflect our view of the Social Compact. We are pulling apart. In 2008 and 2012 Minnesota helped elect the country’s first Black President. In 2016, if you subtract all the votes cast in Hennepin and Ramsey Counties, Donald Trump would have easily carried Minnesota, with 58 percent of the vote. The Nigerian novelist and poet Chinua Achebe said, “Seeing the world from the position of the weak person is a great education. We lack imagination. If we had enough imagination to put ourselves in the shoes of the person we oppress, things would begin to happen.” As a photographic artist and educator I’m interested in the state of the empathetic imagination in contemporary life. The unique human capacity to imagine the experiences and emotions of persons separate from ourselves defines us as people and a culture. It establishes the frame by which we determine our social responsibility as individualistic or humanitarian. In many ways, all the information and wisdom we need to thrive as a global community is contained in our collective experience; we just need to unlock it and engage it for understanding. I use photography as catalyst for unlocking our empathetic imagination, and engaging our shared knowledge and experience. 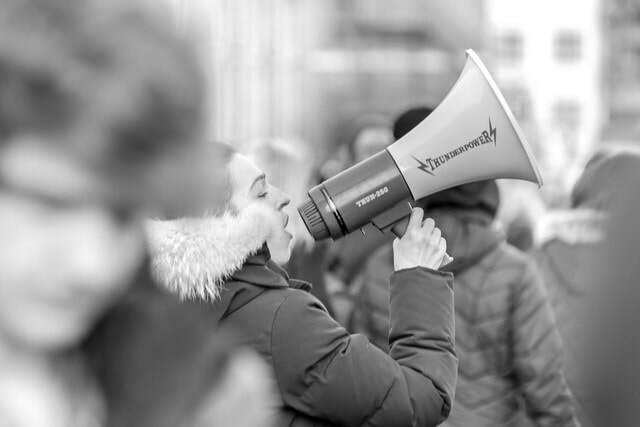 I use journalistic method to search the world for the stories of people, and present them through artistic practice that combines digital and analogue processes, physical installation, narrative text, and live community dialogue to develop engagement and understanding on contentious social issues. My work explores how photography can prompt civic engagement and dialogue through integrated digital and physical modalities. One of the most difficult things a person ever does is to truly see another. I strive to find that miraculous encounter when art, people, experiences and ideas collide; and we discover the universal feelings and knowledge that connects us all. This collection of two-dimensional contemporary fiber art reflects the interests and perspectives of its four creators. Vibrant color, texture and emotion play a role in how each expresses what they see in the world around them. They transform their materials through dyeing, screen printing, painting, burning, piecing, and stitching — to create imaginative and stunning art. These artists are members of theTwin Cities area fiber collective, Truly Unruly — a small work group of Minnesota Contemporary Quilters. They continually experiment, support, and encourage each other in their artistic endeavors. My paintings are impressions of the environment and beauty around me. I love to paint Saint Paul landscapes, including the Highland Park Golf course and the Como swimming pool. My paintings are created using gouache (opaque watercolor) and India ink. Gouache produces brilliant colors and used in combination with deep black ink, can mimic stained glass. My art heroes are Georges Rouault, a painter who worked as a stained glass apprentice early in his career and whose work is filled with love for humanity; and Edouard Manet, with his clean colors and revolutionary use of black. I grew up in Las Vegas, where neon sunsets and neon lights helped form my color sense. I later moved to Philadelphia and was formally educated at the Pennsylvania Academy of the Fine Arts. And now, when I paint landscapes I present small sections of the natural world that are too beautiful to turn away from. My hope is that viewers will see my work and find it evocative in some way. I believe that people know intuitively the landscapes they love and where they belong. I never fail to be impressed by how smart people are when "reading" art and how vitally human the process is. Art is a form of communication, and if people say they want to enter my paintings, I feel I have succeeded.